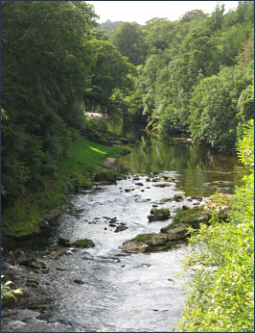 No Scottish game fishing guide would be complete without mention of the sea trout fishing available throughout Scotland. If the salmon is the king of Scottish fish, the sea trout might be called the "prince of darkness", a mysterious, magical creature which appears, literally out of the blue, in many Scottish rivers every summer, lying immobile and unnoticed during the light of day and becoming active only during the hours of darkness - active enough, on occasion, to take a fisherman's fly. For this reason, those who pursue the sea trout are themselves, by necessity, and perhaps by nature, nocturnal creatures. If you, like me, have "something of the night" about you, you might find the following pages of interest. They are all about the great variety of sea trout fishing on the lochs and rivers of Scotland. At one time, not so long ago, Scottish sea trout fishing, to many of us, conjured up pictures of skilled boatmen rowing solid, clinker built boats down age old drifts on wild west highland lochs like Maree, Stack, More and Hope, coming in with famous catches of sea trout taken on the wet fly or on the dap; pictures of short summer nights on west coast rivers when the sea trout fought to get at a well fished fly. But that was before the coming of the salmon farms, the growth of which has coincided with a marked decline in stocks of west highland sea trout. Today, sadly, few fishermen make the annual pilgrimage to the west highlands in search of sea trout. Catches on the once famous sea trout rivers are a fraction of what they were. Boats on the lochs lie idle, hotels rooms empty. Will our politicians come to their senses?...... we can but hope. But, despite the bleak picture in the north west, the sea trout still come in the short Scottish summer to the rivers of the east and south, to the Spey, Dee and South Esk, to the Earn, Nith and Annan. Not perhaps in the numbers of the past..... but that only adds to the appeal, to the challenge. I hope, in these pages, to give some suggestions on where, in Scotland, you might find good, accessible sea trout fishing and some ideas on the tackle, tactics and flies which might, just occasionally, be successful in luring this most game of all game fish. Please select from the following pages for more information.